Hungry Birds can be played on any size touchscreen, the bigger the better. Biggest of all is a touchscreen wall, but not everyone can afford to stage that configuration (to learn more about the wall version, click here). More affordable, and still quite impressive, is a 42″ touchscreen and this is the configuration we recommend to museums planning on buying new hardware to stage the game (Digital Glass is a software company and our prices do not include hardware. Nor do we sell hardware. But we recommend configurations we have tested and know work). 42″ is plenty big enough to allow two people to play the game simultaneously. These prices reflect recent Internet searches. It may be possible to find even better prices, especially if and when educational pricing is available. Links are to the manufacturers’ sites. 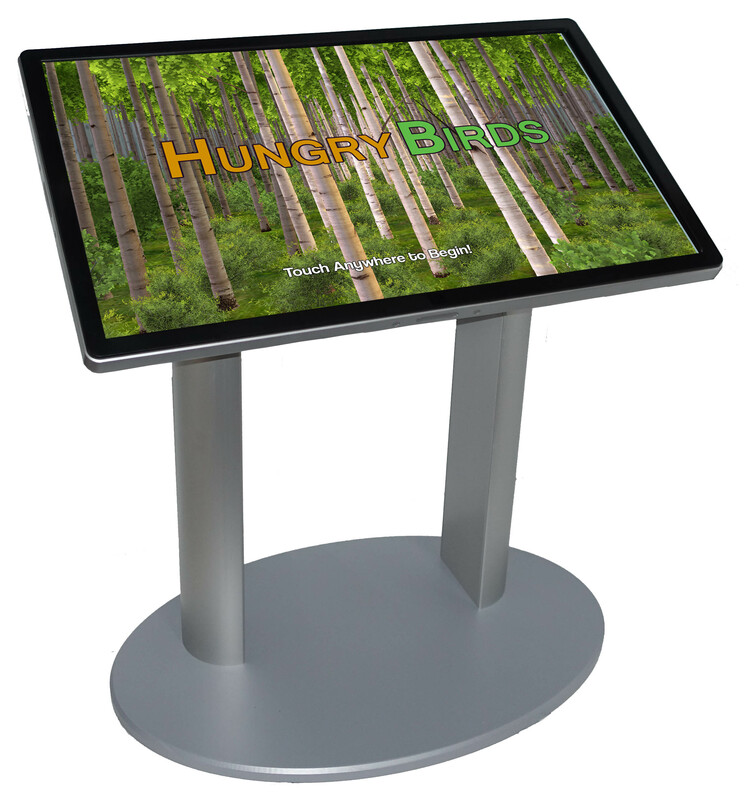 The recommended 42” ELO display unit and accompanying stand meet ADA requirements. Subtracting the height of the bezel (1.25”) at the top of the display unit (ADA height restrictions apply to the highest point of the touch surface, not the total height of the kiosk), the recommended unit has a height of 45.75”, versus an ADA maximum of 48”. The display unit (with the onboard PC module) weighs 57.2 lbs., well within the 80 lb. rating of the stand. The On Board PC (Windows 8.1) plugs directly into the back of the display. There are no cables. It also has a vandal-resistant cover. There is simply one power cable that threads through the stand and comes out the bottom of the base. Hungry Birds can be played on a non-touchscreen PC as well, but it is less fun and when playing with a mouse only one player can play at a time.